Here’s how it went down. I was chit chatting with fellow blogger and Keto-er, Laura from Little Yellow Wheel Barrow. She happens to be a genius at making pretty much anything, food, furniture, jokes. You name it. 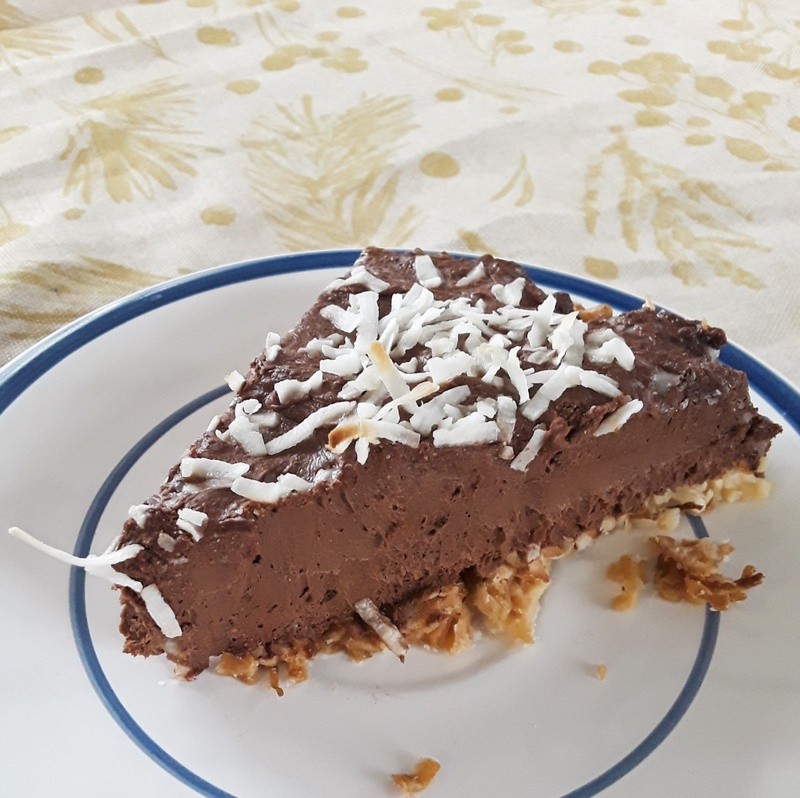 I told her the stuff I had in my kitchen at that moment and she came up with this Keto Chocolate Mousse Cheesecake with Coconut Crust recipe. In like two seconds. It was kind of amazing. Before we get to the recipe, how about a quick update on my journey? It’s been a while and when I last wrote to you, I promised I was going to start exercising and tell you how that went. That didn’t happen. If it’s been a month and a half since I updated you on my Keto progress, then I have probably exercised 6 times in that month and a half. So… I don’t really have anything to say about that. Except I am so incredibly annoyed with myself for not having the motivation to just do a simple work out more than occasionally. I am at a weight now (127!!) that if I just started working out I would probably be in a very happy place as far as how I look. I’m about 75% to that place of being happy with how I look, but summer is right around the corner and some muscle tone would be a great accessory to my shorts. And no amount of Keto Chocolate Mousse Cheesecake is going to give me muscle tone. Ain’t happenin. As for the numbers, I started at 148 lbs and as of yesterday, I was down to 127. Sometimes when I tell people 127, they get annoyed with me and wonder why I am still not 100% happy with myself. Here is some perspective. I’m short (5’2″) and very slight. I’m a small human on average so, even when I weighed a lot more, I didn’t take up a lot of space, is what I’m trying to convey to you. If I lost another 9lbs, I would weigh what I weighed after my daughter was born (she’s 13). If I then lost another 10lbs, I would weigh what I weighed when I got married (16 years ago). My reach goal is the weight I was when I got married, but I’m beginning to think that goal is a little nuts. How flipping skinny was I at 108 lbs?? You know what’s the saddest part of that? I remember being on my honeymoon and just a tiny bit not confident in my two piece bathing suit. What a waste. I will never again in my life wear a bathing suit that doesn’t 100% cover my stomach (stretch marks for DAYS! My son was 9lbs 3 ozs) and probably the last time I did wear one, I didn’t feel great in it. And I most definitely should have. But, whatever, I’ll rock a mommy one piece with no skirt attached this summer. So, in summary, I started at 148 lbs. I am currently, at last weigh in, 127 lbs. I’ve been eating Keto since early December of 2017. Keep in mind the chocolate bunny/twizzler episode from Easter and understand that I gained weight during that time and had to relose those pounds. I don’t say this part often enough. 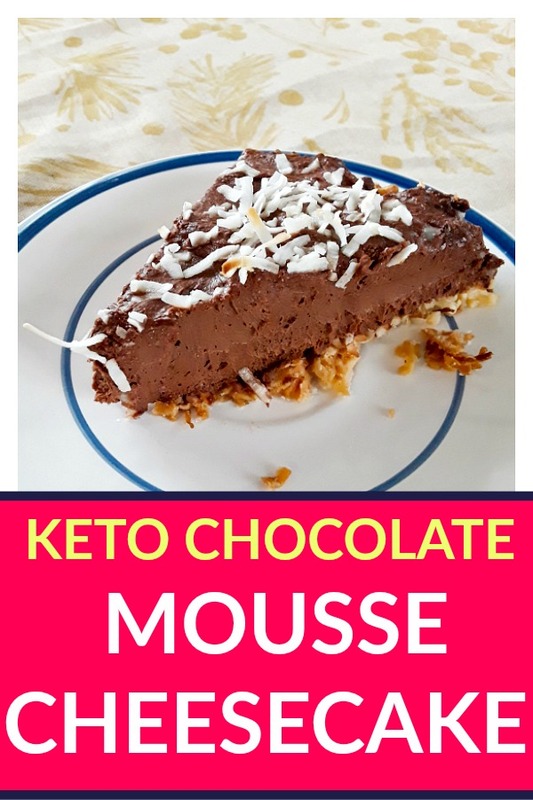 There’s something to Keto that is separate from the weight loss. I can’t remember a time in my life when I felt happier. I have anxiety and it is very much in check when I’m eating Keto. I feel more clear headed and my memory is better. I don’t know why that has happened since I started Keto. Maybe it’s just the buzz of feeling more confident with how I look or maybe it’s something chemical from removing the nasty sugar from my system. I also have far less aches and pains as compared to when I was eating sugar and bread and pasta. That I 100% believe is because I’ve removed gluten from my life completely. If I cheat with some bread or pasta, the old aches and pains come RIGHT back with a vengeance. Cheating with gluten is not worth it for me. Ok, so on to the recipe! And if you scrolled past everything I wrote above, you should totally go back and read. There’s some funny stuff in there! 2 Melt the butter into the coconut and sweetener in a medium pan on the stove. The coconut will get a little toasted. 1 Mix everything in a large mixing bowl. The mixture will be VERY thick and not seem at all like either cheesecake or mousse to you. It’s a hybrid. Don’t worry it tastes delicious. 4 Let the whole thing set up and cool in the fridge before serving. The weekend I made this Keto Chocolate Cheesecake, we took our kids to the indoor waterpark and stayed the night. I find it very easy to stay Keto when not eating at home. There are a lot of simple ways to go out to eat and not cheat on Keto. My body is so conditioned to hating how it feels when it eats gluten that bread doesn’t even tempt me anymore. It’s not worth the sacrifice. If something comes with potato or rice, I politely ask for it to not be included on my plate. I’ve never even had a waitress look at me funny for asking that. The only part that is difficult for me when I’m out to eat, is avoiding dessert. I still crave something sweet at the end of a meal and when I’m home, that’s not an issue. Even if I don’t have a Keto dessert made, I’ll just grab a few dark chocolate chips and I’m good. But for this little overnight trip, I could see before we even left that it would be hard for me to not eat a cookie. The hotel GIVES free, fresh baked cookies when you check in. So, I brought the cheesecake with me. Weird? Maybe. Did it work? Yup. This cheesecake is so good. I started eating it in the hotel room (with a coffee stirrer, because I didn’t think far enough ahead to bring a fork. Whatever, any port in a storm, right?) and when I opened it up, my husband said, “Why are you cheating on your diet??”. And I turned to him and said, mouth full of chocolate cheesecake, “I’m not cheating, this is on the diet”. I hope you have a visual of me spitting those words at him with a literal mouth full of cheesecake. Spouses, if you happen to be reading this, don’t question your wife’s diet when she is mid-bite. It won’t go over well. If you are dying to learn more about the Ketogenic diet, check out Keto Bootstrap. It’s the program I use and it has all of the information you need, meal plans, hundreds of recipes and support!